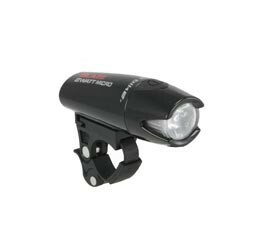 All of Planet Bike's Blaze headlights share similar designs and features, and use the same mount. The main pros and cons apply to all three lights. Better side visibility than some other lights, due to the cut-away on the side that lets light through. SuperFlash pattern is very attention-grabbing. Has high and low brightness settings. Easy on/off mounting, but mount stays on bike, so it’s harder to transfer between bikes. Planet Bike donates 25% of their profits to cycling advocacy! Non-rechargeable (unless you use your own rechargeable batteries). Mount is not as sturdy as some other manufacturers. Poor voltage regulation: light dims as the battery wears down. This is improved significantly in the Blze 2W Micro compared to the other Blaze lights.